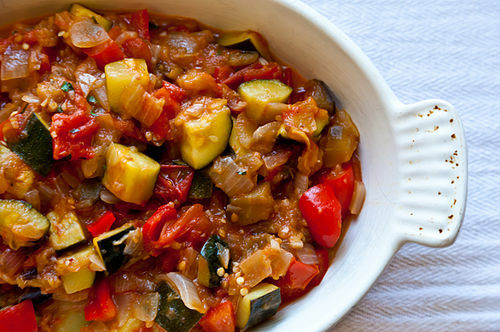 Classic French vegetarian recipe using a lovely blend of eggplant, zucchini, capsicum (bell pepper), tomato, and fresh basil! Oh the lovely smells and it pairs well with fish, chicken or turkey or cannelloni beans to keep this vegetarian. Cook for 2 or 3 minutes, and then stir in peppers. Cook for a few more minutes, and then stir in summer squash. Cook for a few more minutes, and then stir in tomatoes. Please don't rush this recipe or be tempted to bake it. 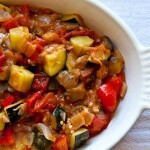 The layering of the vegetables in the order the recipe indicates yields the best results. As Basil is a key part of this, please try to use the freshest you can find.